I bought a brand-new car last week. 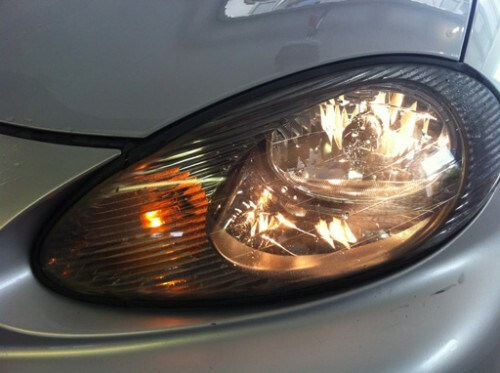 I won’t show you the whole thing, but here’s one of the headlamps. Ha! See, you’re completely unaware of what just happened, but I fooled you! That isn’t a new car at all! It’s just what my 10-year-old light looks like after I refinished it! Oh, I’m so sorry to have taken the mickey out of you like that. But I’m pretty pleased how it came out. My old car is getting up there in years and miles but it’s still running like a top. So every now and then, I address another matter of simple wear-and-tear, like a missing wheel center cap or a busted dashboard light. I mean, I might as well. I reckon I’ve still got another few years before I can finally have a car with a Bluetooth-enabled stereo and integrated iPhone dock. Last weekend, I tried refinishing one of the headlights. You see this problem on just about every old car on the road: the lens in front of the actual lamp is cloudy and yellow. It wasn’t so bad that the light didn’t work, but yes indeed, on a dark road I could definitely tell that the left light was more fogged up than the right one. I did a Google search to see if I could buy a new lens and that’s when I discovered that fixing the existing one was a cheap and easy job. It’s just a little tedious. The problem isn’t the whole lens. The very top surface of the plastic gets UV-damaged. All you have to do is sand off the damaged layer and polish what’s left to a clear shine. Thankfully…there are kits. I bought this 3M kit from Amazon. 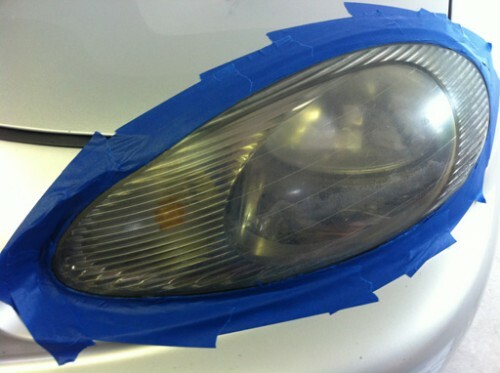 All you need is tape (to tape off any parts of your car next to the lens that you’d rather not grind down with a sanding disc on an electric drill) and a spray bottle (for the wet sanding stage). I was expecting it to make the lens better. I was prepared to screw it up a little and leave the lens looking as though someone who’d never polished plastic before had done a none-too-bright job of it. What I wasn’t expecting was that it would come out looking perfect. And it was a cinch. You sand the lens with two progressively-finer grades of sandpaper, then you wet-sand it, and then you polish it. Refinishing the lens took well under an hour and it was a completely linear process without any confusing decision points. There are videos online that show the process. You should watch them. It was v.helpful to go in knowing exactly what to expect. The best advice I encountered was that putting more time into each step makes the next step go faster and leads to a better end-result. By the time I got to the wet-sanding step, the Sign That I Was Done, as indicated by the instructions, came after only a couple of passes. So just resign yourself to the fact that you’re going to be spending an hour on this project and reflect on the fact that a power tool is doing most of the actual work for you. With circular sanders, it’s the spinning of the disc that does the work and not the force you use to press it into the material. Most of your muscle power should be devoted simply to controlling and guiding the tool. If the disc naturally wants to move from right to left, move the drill from left to right and be the force that controls its progress and keeps it from skipping around. Also, keep the disc moving. Find a bucket or a low stool to sit on. I had fantastic results, but my lenses are just about perfect for this kit: they’re big “bubble” lenses. If they were small and square and had tight corners, I suspect this would have been a much bigger deal. Don’t stress out about the scalloped sanding patterns you’re leaving behind on the lens. With each step, you’re just trying to make sure that you’re making the whole surface of the lens look consistent. Sand out any obvious divots, sure, but rest assured that each successive sanding and polishing step will remove whatever you did in the preceding step. The next-to-last step (the wet sanding) is the “wow” step. This is the step where “OK, um, I hope this lens becomes clear soon” becomes “Hey! The lens is almost completely clear!” So keep the faith until you get to the wet-sanding. The kit comes with enough sanding discs and polish for two lenses. I only did one, but only because I had things to do later in the day. The bottom line is that I had absolutely zero problems getting the job done. And though I know my way around a power tool, I’d never polished plastic before. So this seems like this is well in the wheelhouse of anybody who can follow directions. The directions in the 3M kit were exceptionally well thought-out and covered everything. I was so happy with the results it was actually a bit embarrassing. “Damn, that looks terrific!” I kept saying, as I eyed the results. This was more a compliment for the kit than for myself. It was slightly less-crazy to say that out loud, thanks to the fact that a good pal of mine was curious to see how it worked: I did the job in his garage. When I suggested those plans, I didn’t know that he actually enjoys detailing cars as a hobby. His own cars receive regular loving care with the cabinet full of tools and products in his garage. So when I pulled my car — a vehicle which gets maybe one machine wash a month — into his shop, it was like I’d dropped an RC helicopter and an hour’s worth of fully-charged batteries into his lap. He couldn’t hear me over the sound of the electric buffer but later, he confirmed that this was indeed the case. The first thing, I mean. End result: all in all, my car looks better than it has in years. I took my pal out to lunch. And after yesterday, when a light skim of rain made the detailing job and the restored headlight lens look even nicer, I shamed myself into going on eBay and finally replacing that wheel center cap that I lost God-knows when.